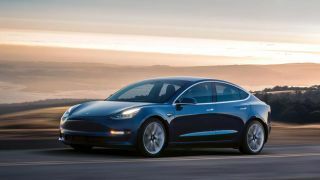 Tesla Model 3 production has temporarily come to a halt at its factory in Fremont, California, marking the second time Tesla has shut down manufacturing for its least expensive EV. This comes after CEO Elon Musk stepped in earlier this month to oversee Model 3 production after Tesla failed to meet its production targets. According to BuzzFeed News, the pause is slated to last four or five days. Employees who spoke with the publication said the stoppage was unexpected, and that they are expected to use vacation days or stay at home without pay while the assembly lines remain silent. Tesla said the pause is needed to "improve automation," which is the same reason the company gave to Bloomberg when asked about the first shutdown in February. Tesla said at the time, and reiterated again on Monday, that a pause "is not unusual and is in fact common in production ramps like this." The EV car company's aim is to produce 5,000 Model 3s per week by the end of the second quarter, and while a temporary pause doesn't bode well for this target, improvements in the manufacturing process could help it meet this goal in the long run.